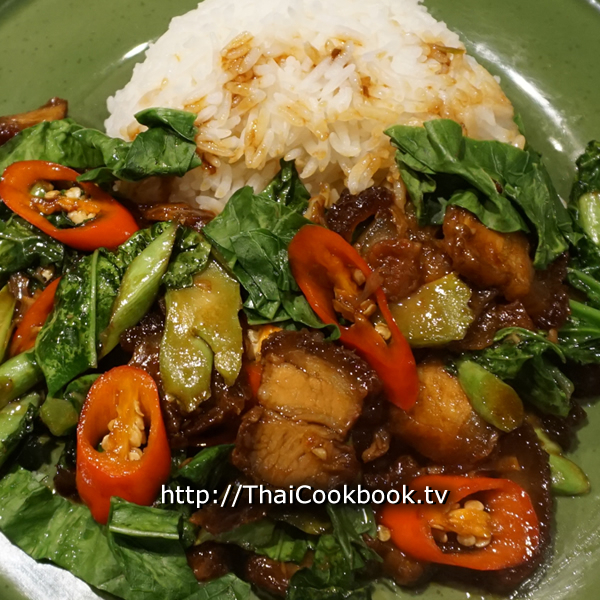 This recipe is for our version of Pad Kana Moo Krob, made with a special dark and sweet sauce. 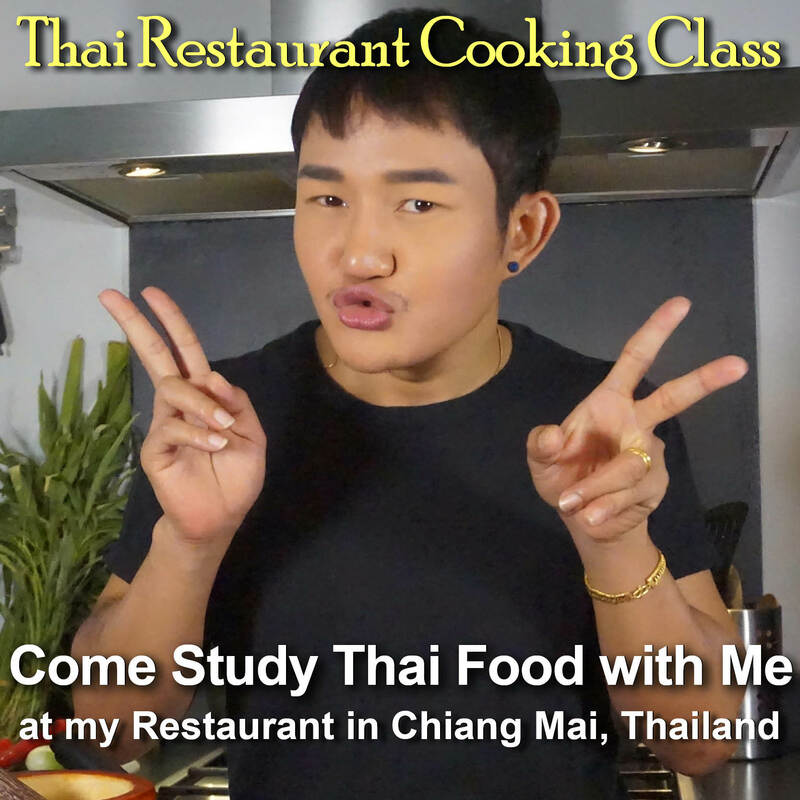 The dish is not at all spicy, so it can be enjoyed by everyone. The ingredients we use include Chinese Broccoli, a dark green leafy vegetable that is similar to kale, crispy pork belly slices, sweet red chilies, and garlic. 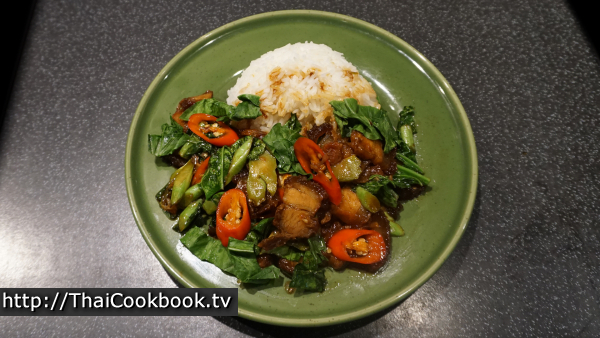 They are slowly stir fried together with oyster sauce and dark sweet soy sauce until a deliciously thick and sticky dark brown sauce is obtained. This is quite different than the usual way of making Pad Kana, which has a very light and thin garlic sauce that is slightly salty. Try ours. We think you'll enjoy it! What's in our Chinese Broccoli with Crispy Pork Belly. How we make our Chinese Broccoli with Crispy Pork Belly. 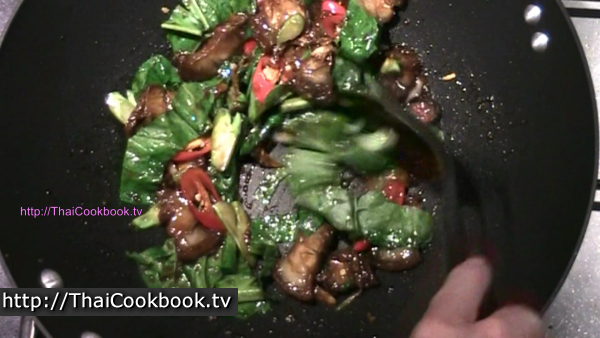 1) Cut the pork belly into slices, cut the red chili and Chinese broccoli, and crush the garlic. Measure and have ready the other ingredients. 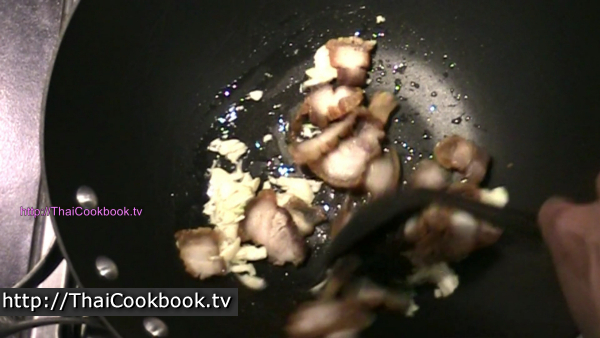 2) Fry the garlic on low heat for 15 seconds, then add the pork belly and fry slowly for 30 seconds over low heat. 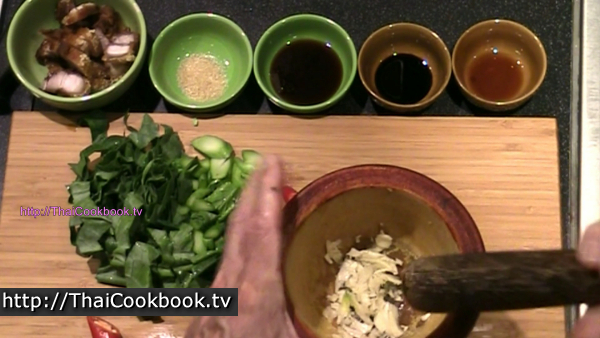 3) Stir in the sauces and sugar and cook over high heat until thickened, then add a little water. Return to a boil. 4) Stir in the red peppers and cook for 30 seconds. Turn off the heat, then add the Chinese broccoli. Stir in well for 30 seconds, then serve. Prepare the deep-fried crispy pork belly according to our recipe found here or use your own recipe. Slice the cold Moo Krob into pieces about 1/4 - 1/2 inch thick. Slice the bottom portion of the stalk of the Chinese broccoli on a diagonal, then slice across the entire leaf portion as you move up the stalk to create long thin strips. Slice the red peppers diagonally. Crush the garlic with a mortar and pestle, garlic press, or just crush them with a knife handle. The important part is to crush them, not chop them, as you want to really push the juices out of the garlic. Measure and have ready the sauces and sugar. Put the oil in a wok or frying pan over low heat. Add the garlic and fry slowly for about 15 seconds. Keep the heat very low so it cooks slowly and doesn't burn. Next add the moo krob slices. Stir them into the oil and garlic and fry slowly until they just get a little hot. You do not want to cook the meat much, as it will dry out and get hard. 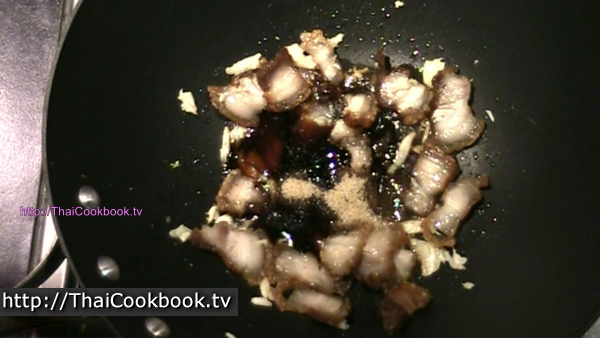 Add the oyster sauce, dark sweet soy sauce, light soy sauce, and sugar. Stir it in well, then turn the heat on high. Let it fry, stir constantly until it cooks down into a thick and sticky sauce and the pan looks dry. 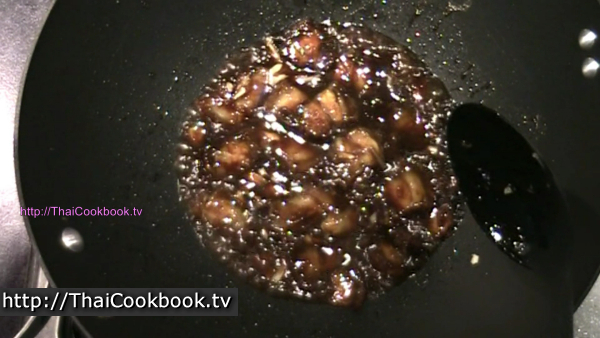 Add 2 tablespoons of water and stir in well to deglaze the pan and create a delicious dark gravy. Let this get really hot again and start to bubble fast. Add the chilies and cook for about 30 seconds. Now turn off the heat and add the cut Kana. Stir it in well and let it cook in the residual heat for about 30 seconds. You want it to stay crispy, so you are really just letting it wilt in the sauce. 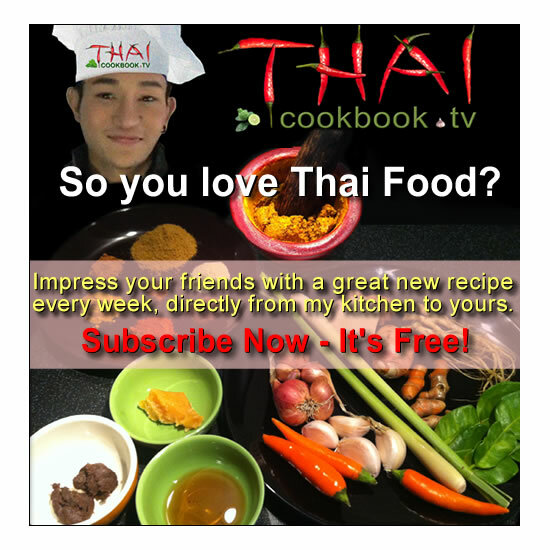 Serve with hot Thai Jasmine rice.